This Authentic Italian Appetizer Will Have Everyone Coming Back For More! The Filling Options Are Limitless! Of the many delightful appetizers that hail from the boot, panzerotto is one of our favorites. 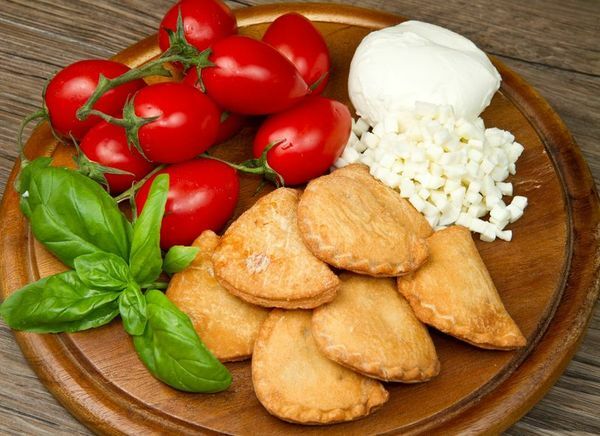 A mouthful of gooey Italian goodness, these fried pockets of dough are stuffed with all range of ingredients, sweet to savory. Classic fillings include salumi, ham and ricotta, and chopped meat with mozzarella. The options are truly limitless, though. Chocolate, caramel, honey-filled panzerotti? Yes, please. Gruyere and prosciutto? Don’t mind if we do. What stays the same is that light, flaky pastry crust. 1. Combine flour, yeast, salt and water to create dough. Allow to rise for about 2 hours. 2. Meanwhile, cut the peeled tomatoes, squeeze them and leave to drain in a colander. Dice mozzarella; once the tomatoes have drained, add the diced mozzarella and season with salt and pepper. Roll out the dough into disks of about 8 inches in diameter and 0.2 inch thick. 3. Fill each disk with the tomato-mozzarellamixture, then fold into half-moon shaped pouches. Folding together the edges to seal the panzerotti. 4. Deep-fry in abundant olive oil. Flip the panzerotti often to prevent them to avoid burning on either side. Wait until the pouches are golden-brown in color. Then transfer to a plate for serving.